Fountain Hotel was opened in 1891 and served as a primary hotel for stagecoach visitors prior to 1904, when the Old Faithful Inn was opened. 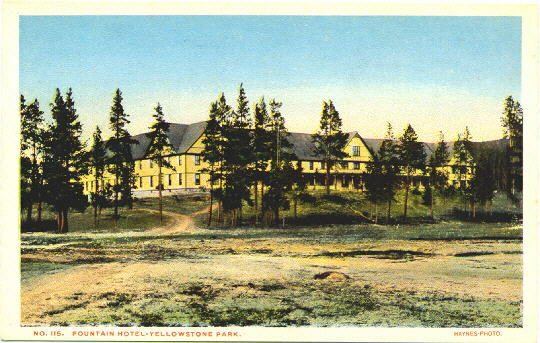 In Yellowstone's early days, visitors stayed at Fountain Hotel, took a day trip to the Old Faithful area, then stayed at Fountain Hotel one more nights before traveling on to Lake and Canyon Hotels. It was here that bears were first fed hotel garbage as visitors watched from as little as ten yards away. The hotel's last season was 1916. 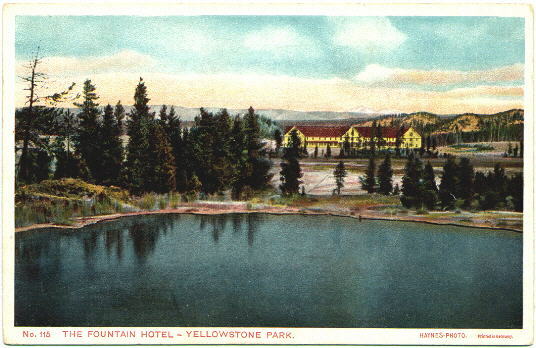 Motorization of Yellowstone in 1917 made the Fountain Hotel obsolete, and it stood empty until torn down in 1927. The hotel was just north of the present Fountain Paint Pots, facing south toward the Fountain Geyser and other geyser features. Sources: A Yellowstone Album, Marsha Karle, editor.